I have never seen so many ants before. Do you have more ants at your house this year too? We had another very COLD winter, just like we did last year but we didn’t have all these ants last spring like we do this year. They are everywhere. Not only am I seeing lots of ants outside but they were inside as well. You know I really don’t care if they are outside… they don’t seem to do any damage.. they are all just busy building ant hills, but I draw the line when they come in the house. I don’t want ants in the house! Someone should of told them to skip my house if they think they are going to take up residence inside with me. I have a silent ant killer… It has no color, no odor, it is a non-poisonous powder that has the consistency of flour… heck they don’t even know they are stepping in it…but it is a real ant killer. 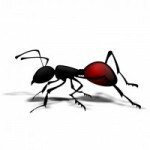 In fact it doesn’t kill just ants but it kills all of those crawly bugs that I can’t stand when they are in the house….. My ant killer is one of Mother Natures Best Kept Secrets…. It has been around for at least a zillion years… it is diatomaceous earth. I sprinkle it around where the ants are and when I come back about 20 minutes later I can sweep up dead ants….. Next time I come back I can sweep up more dead ants. Of course it would be great if your able to find where they are coming from and start at the source. It is not a poison so the little buggers do have to come in contact with the powder. They are not able to build up a resistance to it since it does not work the way most ant killers do.. .Diatomaceous earth kills those buggers by slicing them and they dehydrate….. Way Cool. But… what is even cooler is… I kill those ants and then I eat it for my good health. I also feed it to my dogs and my cats for their good health too…. You can Eat My Dirt…. Food Grade Perma-Guard Diatomaceous Earth… Gotta Love this wonderful product direct from Mother Nature. Perma-Guard Diatomaceous Earth (DE) is EPA approved and registered for use against indoor and outdoor crawling insects, including cockroaches, ants, bedbugs, fleas, boxelder bugs, carpet beetles, centipedes, crickets, earwigs, grasshoppers, ticks, millipedes, scorpions, slugs, and silverfish. For use in Cracks, Crevices, Hiding and Running Areas, Under and Behind Appliances, and Wall and Floor Surfaces. 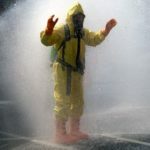 For use in and around homes, office buildings, restaurants, motels, warehouses, theaters, schools, hotels, and food handling establishments. DE is odorless and nontoxic. Indoor and Outdoor Application: Sprinkle a light layer of DE in areas where pests frequent, including under stoves, cabinets, sinks, garbage cans, window and door frames and sills, entrance ways, sewer pipes and drains, and in cracks and crevices. Repeat treatment as needed. For Carpet Beetles: Thoroughly dust along baseboards, carpet edges, under furniture, carpet, and rugs, and in closets and shelving. For Bedbugs: Take apart bed and dust joints and channels. Dust any hollow tubing and the interior framework as well as the mattress and all cracks in the room. For Fleas: Thoroughly dust carpets and pet’s bedding and sleeping areas, as well as cracks and baseboards. It also can be rubbed into your pet’s fur. 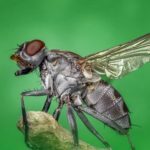 For Flies: Thoroughly dust areas where flies frequent (walls, straw bedding, livestock pens). It also can be applied to livestock coat as an insect repellent/contact insecticide. DE is composed of finely milled fossilized shells of minuscule organisms called diatoms. The microscopically fine, sharp edges desiccate the insects’ exoskeleton upon contact and the pests dehydrate and die within hours. The insects also die when they eat the dust. the U.S., only 4 rate in purity by FDA standards to label as “Food Grade”. pet food health supplement, cat litter odor control and whiter teeth! Don’t Forget our Best Friends – Dogs, Cats, Birds, Rabbits..
and as a health supplement to add to their pet food. Please see our “Critters” page. Food Grade Diatomaceous Earth is a mainstay for organic pest control on farms. and garden insects never become immune. DE kills bugs physically, not chemically. Farms and Ranches use Food Grade Diatomaceous Earth as a feed supplement for animals and livestock for better health. DE is also recommended by veterinarians as a health supplement when added daily to pet food, and as a topical flea control treatment. Food Grade DE can also be found in food that is eaten by most people every day, as DE is widely used and FDA approved for use by the nation’s farms in agricultural grain storage. This brings us to one of the most exciting trends … Increased use of Food Grade Diatomaceous Earth for human health benefits. Because of FDA control and oversight of labeling, many wonderful natural, herbal or organic supplements will seldom if ever claim to be treatments or remedies for specific maladies. This is also true of Food Grade DE. Within this site, you can learn about DE as an effective bed bug remedy and also of the many everyday household uses for this remarkable substance. Every home should have it. REQUIRED FDA DISCLAIMER: Content on this site is for reference purposes only, based on reviews from users of food grade diatomaceous earth. It is not intended to substitute for advice given by a physician, pharmacist, or other licensed healthcare professional. User statements regarding DE as dietary supplement have not been evaluated by the Food and Drug Administration and are not intended to diagnose, treat, cure, or prevent any disease or health condition. Those with health problems, pregnancy or who are nursing are specifically advised that they should consult their physician before taking any nutritional supplement. ABOUT EPA LABELS: All of the Food Grade DE that we sell is exactly the same product on the inside, but there is a very important difference in the labeling. Because DE kills insects, only when used for that purpose, it falls under EPA regulatory control. All of the claims that we make on this site about killing insects can only be made on food grade DE with the EPA label on it. We sell the EPA labeled product in 5 and 50 lb. bags. We also sell the NON-EPA labled 50 lb. bag. Most of our packaging reflects general use, and therefore has no EPA label on it. If you purchase the non-EPA labeled product, you acknowledge that you are buying the diatomaceous earth for some other purpose than for killing insects. I found this short video about a bed bug feeding on an arm. It made me itch all over. To think that many homes are infested with these nasty bugs. People as well as pets sleep in beds that are loaded with them. Tell me your able to watch this and NOT itch TOO! You can order your diatomaceous earth HERE to kill these nasty bugs safely, using an all natural product that is indeed good for everyone and everything. I have to tell you about a book I bought that contains so much wonderful information about Diatomaceous Earth. I thought I knew a lot about this great product that I have been using but I have found I didn’t know hardly anything. The book is called Going Green Using Diatomaceous Earth How-To-Tips, by Tui Rose, R.N. This is a very informative book on all the many uses of food grade diatomaceous earth!! The author goes into much detail on everything from using DE for pets to pest control to people. Most of the information in the book is based on her many years of actual experience with DE. You will not be far into the book when you will catch her passion for all the many uses of safe and natural food grade diatomaceous earth.If you are interested in the many benefits of using diatomaceous earth this is a must have book for you. The other day I sprinkled some dry cat nip on a small rug for my cat that was lying on it. He of course went crazy the way most cats do when they are exposed to cat nip. 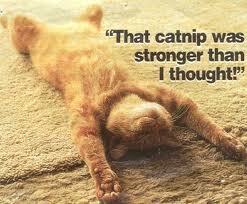 Most cats love catnip. They roll in it and try to eat it. Some salivate when they are around the aroma of catnip. It really is fun to watch how they react to it. It is defiantly intoxicating to most cats. So I had this BRILLIANT idea of adding diatomaceous earth to the rug too. This cat was not only having a great time rolling in the cat nip but he was also rolling in the DE and dusting himself for fleas and other crawly things. Several of my other cats came to the rug and took their turn rolling in the cat nip and the De. When everyone had their fill I took the rug outside and shook it over my flowers. Now that is what I call recycling!! 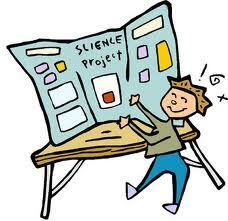 Many People attend school science fairs. What a great introduction to the community of the many benefits of Diatomaceous Earth. A whole display could be created about this dirt. Showing benefits and uses. You could purchase a 50# bag of DE, repackage into smaller bags and sell it. You could have cards printed and flyers made so that people would be able to contact you to place an order. Many years ago I went to a ladies house, she was a wildlife rehabilitator, she specialized in raccoons. She had many other critters in her house and she had no carpet what so ever. She only had wooden plank floors. It was as though she had not gotten around to putting in the actual flooring yet. She had a strange substance on the floor that I just had to ask about she proceeded to tell me it was borax. She saw the puzzled look on my face and said you know… the horse team…”20 Mule Team Borax”. OK OK I then knew what she was talking about. She said with all those critters that she brings into her house she wants to keep the fleas and the bugs at bay as best she can. So she uses borax on the floor. It settles into the floor boards and works as a barrier against fleas and other bugs. It would have been perfect for her. Diatomaceous Earth is an all natural product that you can eat. 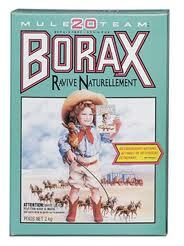 I am sure you can not say that about borax.